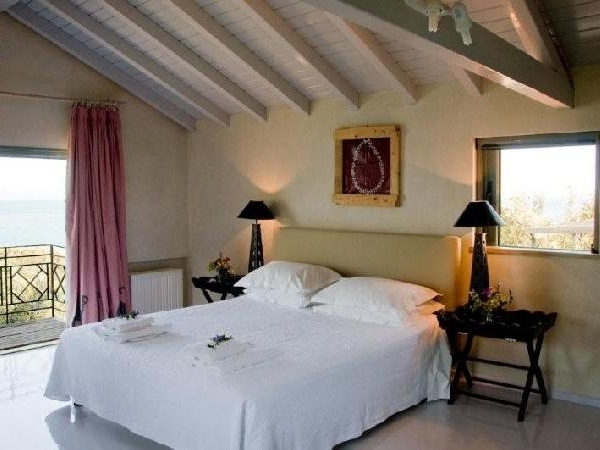 Marnei Mare consists of three villas; Villa Nicholas and Stelios have 3 bedrooms with en-suite bathrooms. 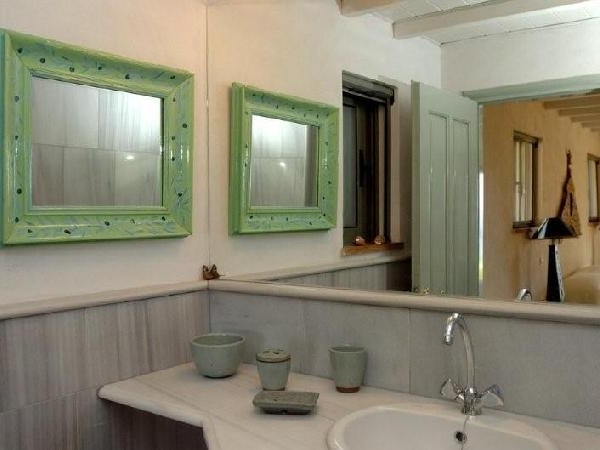 Villa Katerina has 4 bedrooms, 2 en-suite bathrooms and one guest bathroom. The hospitality concept at Marnei Mare is a unique blend of the best elements of traditional Greek hospitality, the discreet service and attention to detail of a luxury hotel, and the intimacy of a private villa in a stunningly beautiful setting on the north western coast of the island of Samos near Karlovassi. Without compromising privacy, due to its unique location, Marnei Mare creates a refuge of tranquility and wellness. From dawn, when the sun rises from behind the mountains, to dusk, when the sun slowly sinks into the sea, this organic, eco conscious environment delights with its calming atmosphere, and rejuvenating energy. The evergreen island of Samos lays on the eastern rim of the Mediterranean. 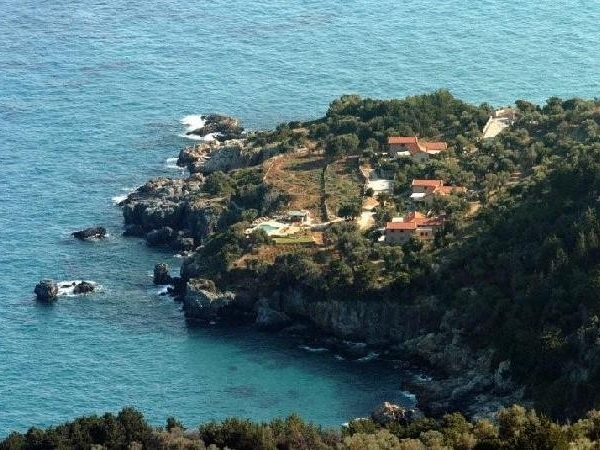 Birthplace of the mathematician Pythagoras, the astronomer Aristarchus, the philosopher Epicurus, the historian Herodotus, and the fabulist Aesop, Samos’s history is rooted in mythology as the island where the goddess Hera was born. The Heraion, an impressive sanctuary where she was worshipped, has been declared a Enesco World Heritage Site. Another site unique to Samos is the Eupalinos Tunnel, a technical marvel dated to the 6th century B.C. and which was used to supply the town with fresh water from the other side of the mountain. Since antiquity, Samos has been famous for its sweet Muscat wine. The island delights visitors with its diverse landscape and profuse vegetation—forests, endless mountain paths, striking beaches, traditional villages, archeological sites, and monasteries. 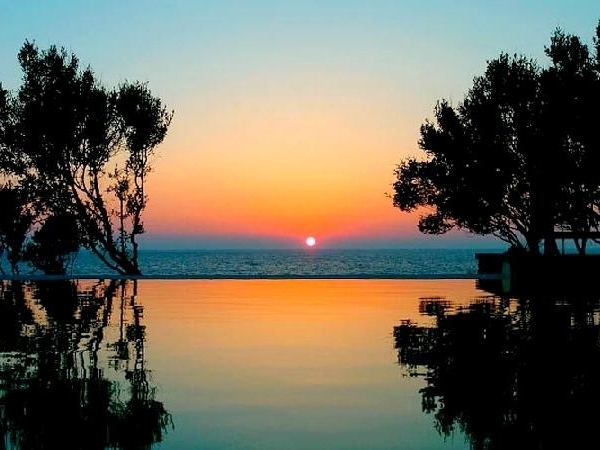 Marnei Mare’s cluster of three beautiful private villas and the discreetly withdrawn reception cottage are set in a 40.000 m² orchard reaching from a lush pine forest down to the crystal clear Aegean Sea. 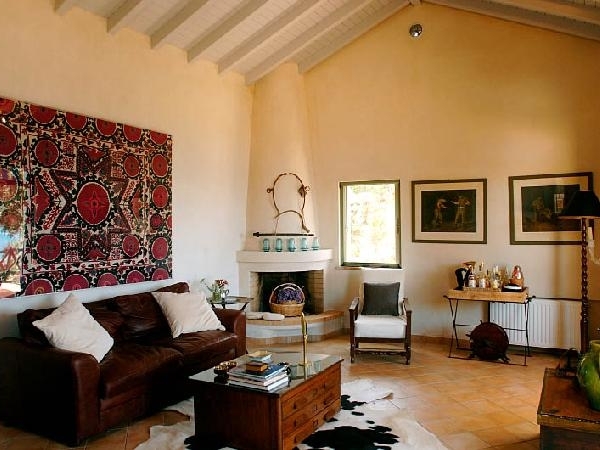 The villas’ stucco finish replicates the colours of the earth and the pebbles of the nearby beaches, while the traditional dry stone walls were built by local stone masons, creating a setting that is in perfect harmony with the natural environment. The orchard itself overlooks Megalo Seitani beach, a designated conservation area for rare fauna and flora. 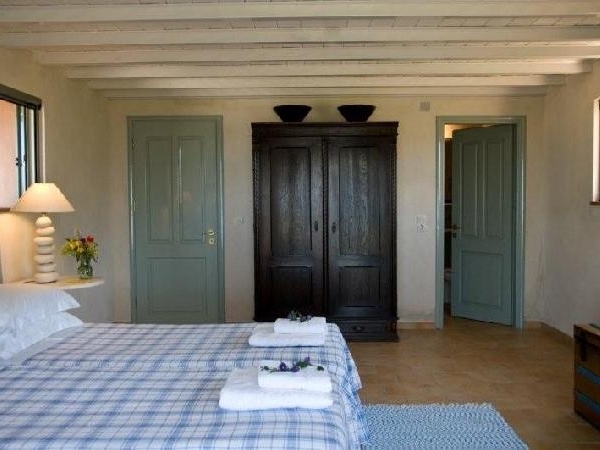 Apart from the villas, the orchard includes an olive grove, a vegetable garden, a vineyard with a variety of grapes, aromatic herb gardens, colourful flowers and luscious fruit trees, all grown and tended according to strict organic guidelines. In this scenery, guests can choose to either relax on their villa’s verandas, swim and snorkel at the property’s two private coves, lounge by the pool taking in the views and being pampered, or set-off on excursions, whether to nearby Karlovassi with its nightlife and restaurants or, by sea or road, to a multitude of coastal or inland destinations which offer a broad variety of activities and pastimes. Marnei Mare is conveniently located 45km from the Samos International airport and just a five-minute drive from Karlovassi town and port, which combines traditional elements and locations, with all modern facilities and amenities. Each of the three villas at Marnei Mare are carefully designed and equipped as would be a luxury private family vacation home. The villas are light and sunny, and thoughtfully decorated with a blend of local and European objects and fabrics, and furnished with comfortable and modern sofas and beddings. The bedrooms are cool and spacious; offer distinctive views while maintaining privacy, and have Greek marble-finished en-suite bathrooms. The fully-equipped open-plan kitchen is separated by a counter with stools from the adjacent dining area, offering unobstructed sea views. The dining area opens into a comfortable and cosy sitting room with sliding French windows that spill out to verandas with stunning sea views. High-ceiling with exposed wood beam gables, sitting rooms feature working log-burning fireplaces for cooler early spring and late autumn evenings. 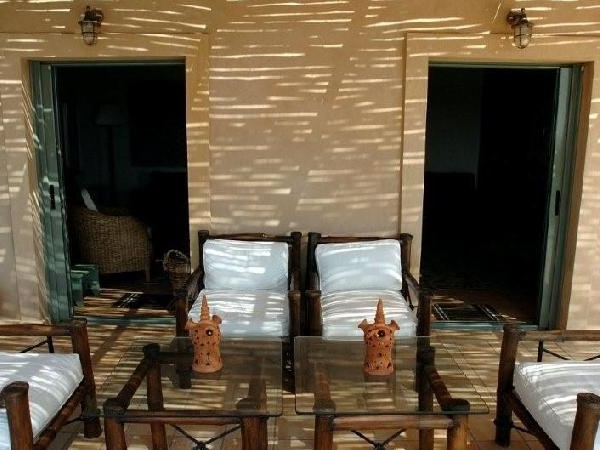 The kitchens also open onto the shaded rear patios equipped with a charcoal-burning barbecue where mouth-watering grilled meat or freshly-caught fish can be prepared. Each patio has an outdoor shower, ideal for a quick cool-down when sunbathing in the garden or returning from the beach. 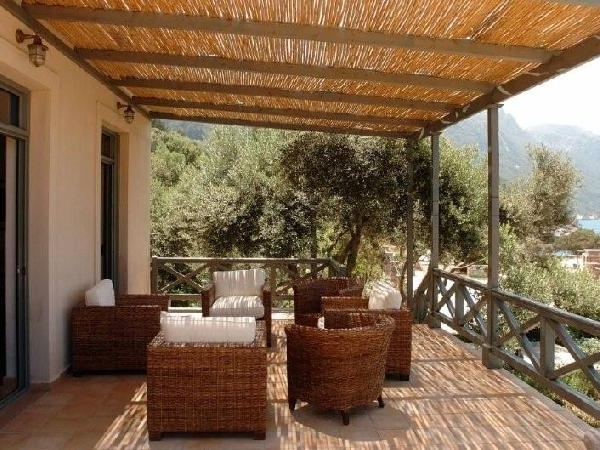 Terracotta-tiled front verandas are shaded by wooden pergolas and offer stupendous panoramic views of the property’s gardens and vineyard, the southern Aegean, and Samos’s incredibly lush mountains. Verandas are ideal for relaxing over morning coffee or a sunset cocktail. Each of the three villas boasts its own private landscaped paved garden which offers a third al fresco dinning area option to guests. Swimming at Marnei Mare can become as easy or challenging as one would wish; two private coves with their crystal-clear blue waters are steps away from the villas, however if even this seems like too much of an effort for guests, they can head to the property’s dramatic overflow swimming pool while children use the baby pool. Comfortable sun beds on the coves and by the pool are ideal for lounging long past sunset. The pool bar serves juices and drinks, while hammocks set under shade trees are ideal for an afternoon siesta after lunch to the lullabies of cicadas and the sea lapping the shore. At night, stretch out anywhere for some stargazing, with the naked eye or one of the telescopes provided in each villa for guests’ use: be prepared to make a wish on a shooting star. Beyond the villas many options are open for active guests who seek to explore the surroundings on foot. The coast is riddled with secluded coves linking the property to Megalo Seitani, the island’s most gorgeous beach and a nature reserve. Inland, hiking trails wind through a lush, herb-scented landscape, with breathtaking views over the island and the sea. Swimming can also be an adventure, either by simply snorkeling around the coves, a fun and unique experience for guests, or exploring the water caves framing the nearby sand beach—ideal for a romantic swim or a family adventure. Once through the gates, guests enter the carefree environment of Marnei Mare, where all logistical and practical burdens can be handled by staff, while turning the focus on acquiring ones personalised holiday pace. Guests can be greeted at the port or the international airport and lead to their villa at Villa Mare. On request, Villa Mare will stock villas on arrival or even have a meal waiting, aside to the customary welcome hamper of local delicacies. Daily maid service includes cleaning, making beds, and washing dishes. Bed linens are changed twice a week and washed with environment-friendly detergent and freshly dried in the sun; fresh bath and beach towels are provided as necessary. Staff will be happy to arrange for the laundry and dry cleaning of our guests’ clothes. Personal touches such as vases of fresh flowers and little surprises such as a refreshing jug of freshly squeezed lemonade ensure that the maid’s services will never have the feeling of a visit from a hotel housekeeper. Breakfast may be served by the maid from a pre-selected menu including freshly squeezed juice, a basket of just-baked breads, home-made fruit preserves, our own organically grown produce, local cheese, honey and yogurt, eggs from the farm and more. On request, lunch can be served from a menu of typical Greek summer dishes or guests can be provided with a hamper for a picnic by the beach or up on a mountain top. An alternative choice may be to order some fresh fish or local meat, for a barbecue in the evening, with or without the discreet help of staff. Full concierge service is at guests’ disposal to take care of anything from making transportation and vehicle rental arrangements, to organizing excursions, cultural tours, mountain bikes, fishing trips, sailing cruises, boat charters, to providing babysitting options or even booking a rejuvenating massage. Involving guests in the traditional day to day activities of the property such as the preparation of sun-dried tomatoes in late July, the grape harvest in late summer, olive and mushroom picking in autumn, the first “souma” degustasion in late autumn, and the daily picking of fruits and vegetables, can be happily arranged. 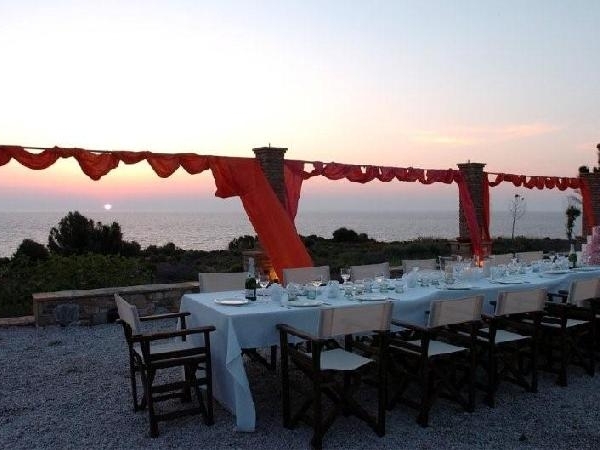 At Marnei Mare we will also be more than happy to help with all advance arrangements for more complex and important events such as weddings and wedding receptions, corporate retreats, family reunions, birthday celebrations etc. Many of these events can be held in the multi-function, outdoor-pillared area in the gardens which is also available for talks, meditation, and exercise. The villas are light, sunny and include fully equipped kitchens, marbled baths and showers, indoor and outdoor seating and dinning areas, outdoor shower and barbecue, satellite TV, internet, DVD, CD, telephone and fax service. All linen and toweling is of the highest Frette quality and included in the price are all the services mentioned earlier, such as the daily maid service, organic produce, and security. Marnei Mare services :Once through the gates, guests enter the carefree environment of Marnei Mare, where all logistical and practical burdens can be handled by staff, while turning the focus on acquiring ones personalised holiday pace. Samos is the most visited island of the North-Eastern Aegean Islands, keeping nevertheless its beauty and calm places. 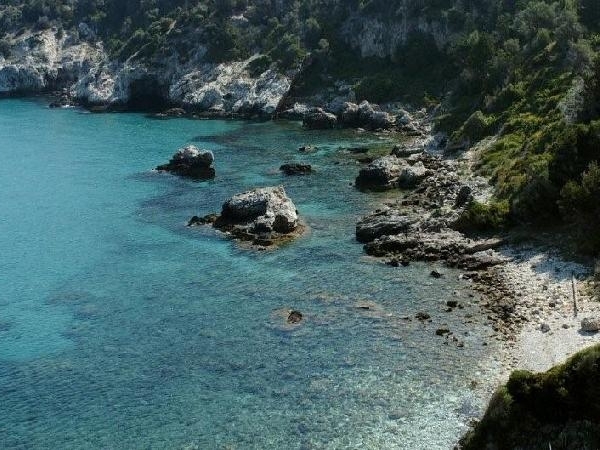 Samos is a particularly green island which has kept a big part of its impressively green forests. It is an island with unique natural beauties which combines history and tradition with it. Samian wines have won prestigious international and domestic awards. Samos is also known for its folk art and produces beautiful pottery, ceramics, rugs, bags made of goat wool and woven fabrics with beautiful designs and colours and which are made on local looms.On the northeast side of the island of Samos is the capital. Built amphitheatrically along the perimeter of a large bay, next to the harbour, it pleasantly predisposes the visitor with its Aegean colour, its neoclassical coastal zone and the beautiful beaches that surround it.